. Jakarta citizens, be cautious of flooded areas…Check the locations of flooded areas on PetaBencana.id…Here are some screenshots of yesterday’s flood, in the morning, afternoon, and evening. 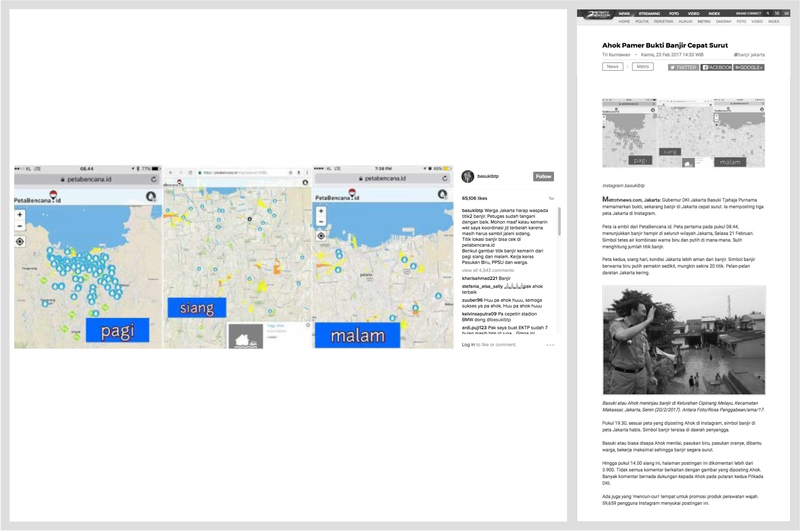 The governor of Jakarta, Basuki Tjahaja Purnama, posted annotated screen captures of Petabencana.id to his Instagram account during the 2017 monsoon season, calling for residents to check the map in order to stay informed. In a story about the Governor’s social media usage, MetroTV News described how emergency management agencies were able to respond to the flooding situation immediately because of the platform.